Recycling is important since it helps conserve scarce resources and plays a key role in any effective corporate environmental management plan. Westminster City Council Commercial Waste Services only offers high-quality recycling services that help reduce the burden on the environment and your wallet. 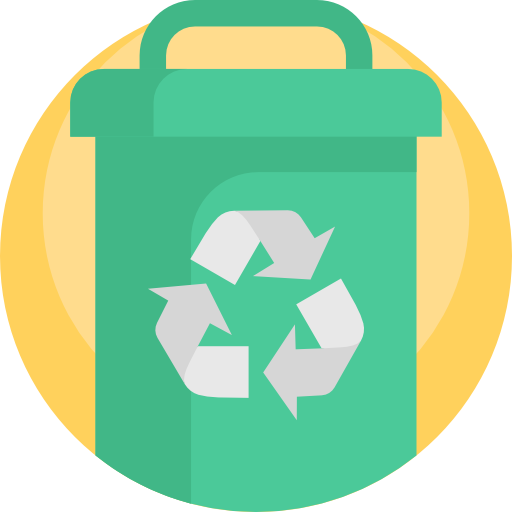 We don’t cut corners or offer low-quality recycling solutions with questionable environmental credentials as often seen with other waste collectors. We are the market leader in recycling and can help your business with setting up and implementing a tailored, easy to use, cost effective and green solution to your recycling collection needs. How does recycling in Westminster work? If you have off-street storage space we strongly recommend you use one of our recycling bins. They are by far the best way to have your recycling collected. They come in big and small sizes depending on how much recycling you produce. Source segregated glass, paper/cardboard and food waste are normally not suitable to be collected in bags and as such are collected through dedicated bins. Just contact us to set up a collection agreement. If you can’t store a recycling bin within your premises then please use the blue bags for mixed recycling. They are sold on a pre-paid basis so you only have to pay for what you actually use. The price of a blue bag pays to have it collected by the truck and for it to be sorted at the recycling facility; safely and to high standards that don’t harm the environment. No contract is required. Simply order the bags online or by phone, fill them with recycling and leave them out for collection at the scheduled time. Please see this link for further information on where the recycling we collect from you goes. For general waste, please see here. If you don’t have space to use segregated recycling streams then mixed recycling is your best option. We do all of the sorting for you after collection in a materials recovery facility. This means that you only need to separate those materials that can be recycled. Paper and cardboard is a high-quality recyclable material so it’s best to keep this separated from other materials. 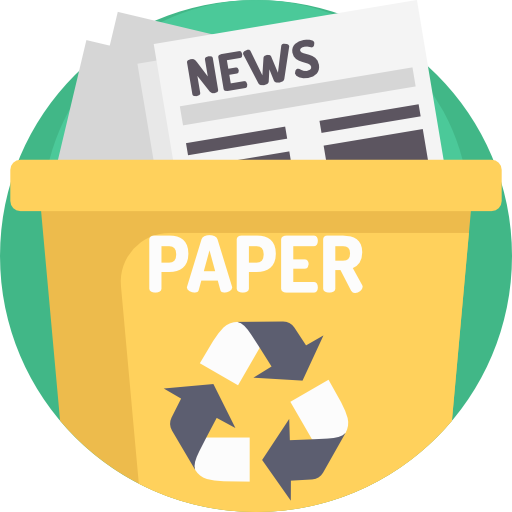 Paper and cardboard can be recycled multiple times, as such, they are sort-after materials, this means can also save money by disposing of them separately. 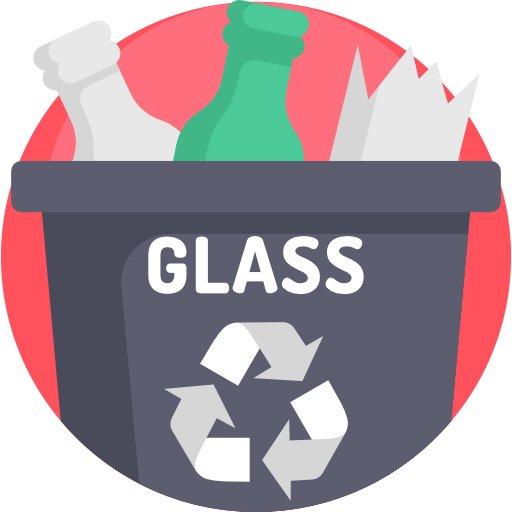 Businesses in the hospitality sector can benefit hugely from using glass recycling services. In this sector, huge amounts of empty bottles and jars are thrown away every day and by disposing of them separately you will be helping the environment and keep your costs down. 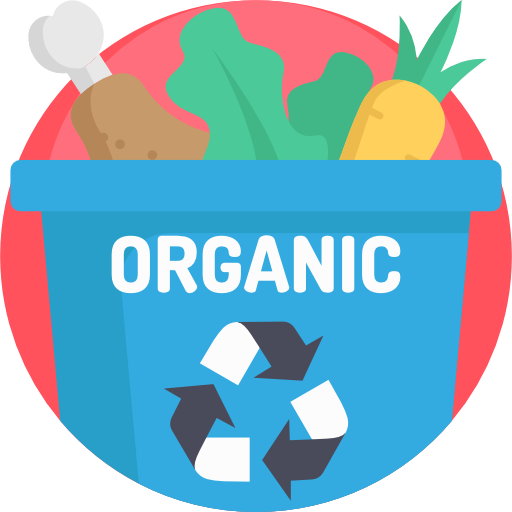 Food waste can be used for numerous renewable resources, so it’s important not to waste this. We dispose of your food waste in an anaerobic digestion facility where it is turned into biogas that can contribute to the national grid and fertiliser to be used on farms. Electrical waste of any size cannot be collected as part of your general waste or mixed recycling services. This means that to dispose of these items you must take them to a rubbish bank or arrange an ad-hoc collection to ensure that they are properly disposed of. 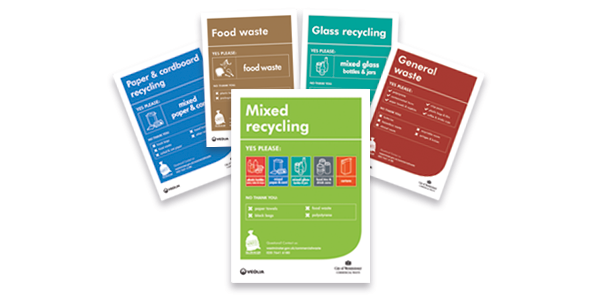 Plastic bottles, pots, trays and tubs can be placed in your mixed recycling bin or bag. 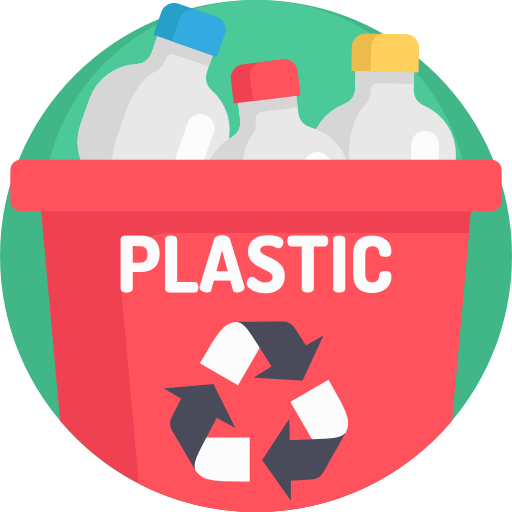 However, there are some types of plastic that cannot be recycled in Westminster and must be placed in your general waste. A full list of plastic containers you can recycle is listed at What Can I Recycle? Putting the wrong materials into the recycling can cause whole truckloads to be rejected. The most common contaminants found in recycling loads are black bags, food waste, food-soiled packaging, sanitary waste (e.g. paper towels, napkins etc), wood, polystyrene, hazardous waste such as batteries and paint, bulky items and electrical appliances. Westminster can collect this waste as part of general waste or bulky waste collections. We have a range of resources that can help you to become more sustainable and recycle to a high standard. Below are three of the top resources that can help you with recycling. 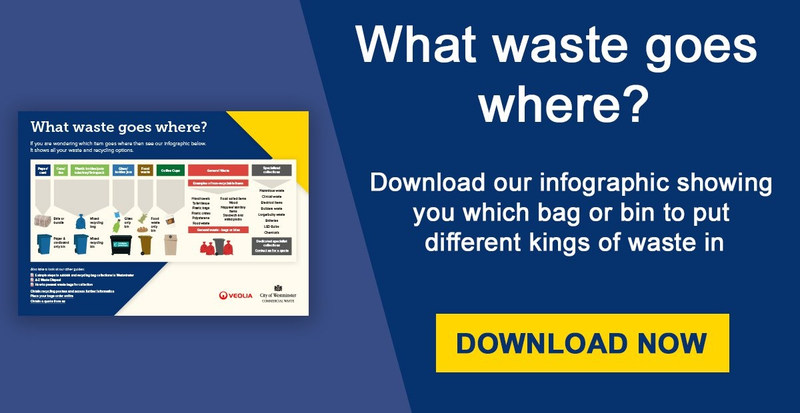 With all of the different types of waste and recycling bins in Westminster, it can be hard to know what waste goes where. In this guide, we show you visually where each material belongs. 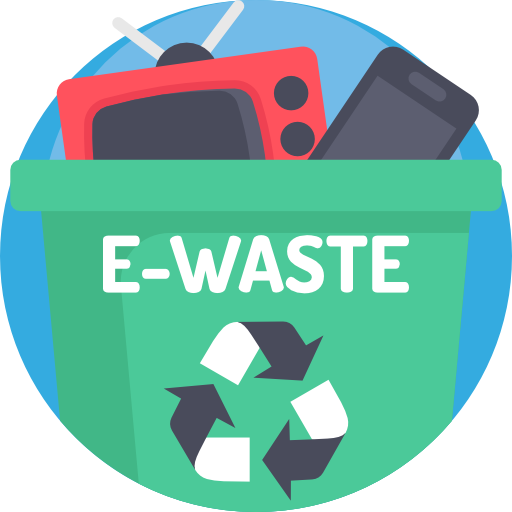 There are also useful links that you can follow to learn more about each waste stream. Putting your waste in the correct bin or bag allows for the materials to be recycled much more efficiently. This guide will help you making recycling as easy and straightforward as possible. Get your copy by clicking the image of the guide. Get your copy by clicking the image of the posters. Waste bins (also known as containers) are ideal for businesses that have enough space to keep them off of the street. They are the preferred way of collecting rubbish and recycling and are much easier and hygienic to use than pre-paid bags. 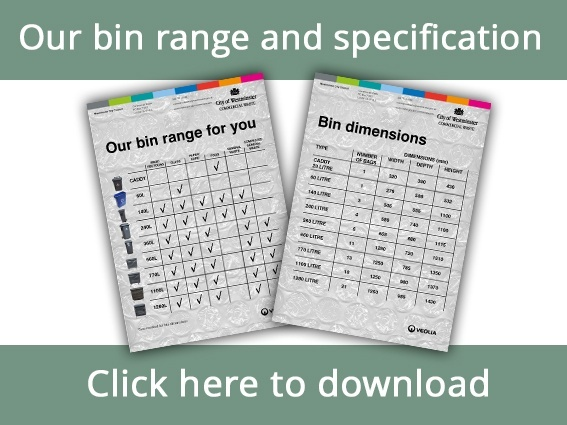 Whatever your requirements, we can tailor a solution to suit you with our range of wheeled bins.